Sand castles, surfboards, fishing rods, beach toys and umbrellas - all part of a day at the beach - can be dangerous and even potentially deadly to Florida's nesting sea turtles. Each spring turtles begin emerging from the surf in the dark of night, crawl toward the dunes and deposit hundreds of leathery, ping-pong-sized eggs beneath the sand before returning to sea. After about sixty days the eggs hatch, the tiny turtles climb out of their nests and make their way back to their ocean habitat. The males never come back to land; the females, if they survive to maturity, will return to the very same beach to repeat the ancient ritual that has insured the survival of their species for 70 million years. 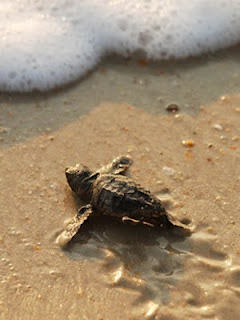 The east coast of Florida is the second largest loggerhead nesting beach in the world. The first is in Oman, on the Arabian Sea. Today their survival is threatened. All five species of Florida’s nesting sea turtles - the leatherback, loggerhead, green, hawksbill and Kemp’s ridley - are listed as endangered or threatened. Sea turtles have many natural predators on land - raccoons, ghost crabs, foxes, fire ants, feral dogs and cats - that raid their nests for food. But a much greater threat to sea turtle survival can be items left behind by humans. Sand castles not swept away by the tide can obstruct the turtle’s journey to nest, as can umbrellas, canopies and chairs left on the beach overnight. Encountering these obstacles, the mother will often abandon her attempt to lay her eggs, or worse, she may get trapped causing injury or even death. Entanglement in fishing line also has serious consequences, impeding the turtle's ability to crawl and swim. Sea turtles often mistake trash - such as empty soft drink bottles, paper, foil and balloons – for food and eat them. Artificial lighting along the beach is another hazard to newly emerged hatchlings. Hatchlings crawl toward the brightest point, traditionally the moon-reflecting on the sea. Lights draw them away from the ocean where they may get caught in swimming pools, be exposed to additional predators or die from dehydration after wandering in the dunes under a blazing sun. During the nesting season, SOS! Florida and other state volunteers will patrol the beaches to identify and correct potential threats to the emerging hatchlings. Fill in holes on the beach and flatten sand castles at the end of the day. Remove all personal belongings such as beach chairs, toys, umbrellas and canopies from the beach each day. Pick up any litter on the beach and dispose of it properly. If possible, avoid using flashlights, building bonfires, or displaying fireworks on the beach between May 1 and October 31. Report any direct and non-direct reflective artificial lighting along the beach during nesting season to the county. Find a list of contacts by clicking here.